Today’s guest post is a 360 review of MacKenzie McHale of HBO’s The Newsroom. If you’re not familiar with them, a Corporette 360 review examines a fictional “professional” woman’s attire and critiques it from all perspectives: underling, boss, friend. Today’s guest post is from Emily Ward-Dickerman, the editor-in-chief of mock-off.com. Welcome, Emily! If you passed MacKenzie McHale walking down the street you likely wouldn’t suspect she was a highly successful news producer. But, as the executive producer of News Night, a nightly news show on fictional cable network ACN, MacKenzie — or Mac as her associates call her — manages a team of 100+ producers, researchers, bookers, editors and controllers. Mac is played by English actress Emily Mortimer* who does a brilliant job of portraying Mac’s clumsy quirks, wide-eyed honesty and savvy instinct. Her wardrobe can best be described as simple professional –- a collection of pieces that can be found in the local mall, but nothing close to the top-trend designer clothing you might expect a television producer to sport. When we first meet Mac she is thrown into her new EP position working with her ex-boyfriend, news anchor Will McAvoy (played by Jeff Daniels). Her goal is to bring a new kind of news to the cable network — one focused on truth and integrity rather than shock-value and exaggeration. In order to do this Mac and her staff must track down the most trustworthy sources in topics ranging from political shakeups to national disasters to the economy. While Mac stays up to date on breaking news stories, she is not one to keep up with fashion trends. She does find a way to pull her reachable business look together. While not a fashionista, she does find a way to pull her reachable business look together (anyone with access to an Ann Taylor could mimic her style). Her mind is sometimes jumbled but her wardrobe is never hurried. The Good: Mac’s look can best be described as professional yet comfortable. She is on her feet 8 hours a day gathering facts and sources, leading production meetings or watching the newscast from the control room. She lives in pencil skirts, flowy blouses, long cardigans and plain black heels. Mac’s simple wardrobe mimics the honest, to-the-point type of newscast that she is trying to run. Mac’s hair and make-up are also uncomplicated. She opts for an easy hairstyle – shoulder length and generally parted to one side – perfect to wear under an unforgiving headset. Her makeup is constant day to day – dark lids and lashes with a raspberry lip. The Bad: Mac is big on loyalty, which is a great thing when it comes to her professional relationships, but does lead to some redundancy in her wardrobe. Her outfit formula is cookie cutter – flowy blouse, tucked in to either a pencil skirt or slacks, and black heels. I have no issues with these choices, but I feel like she should change up her accessories. She is almost always wearing the exact same gold hoop earrings, black leather watch and gold disc necklace. Also, while the formula for the outfits is okay, sometimes her tops are less than flattering. Patterned tops tend to age her and she ends up looking like a middle school teacher circa 1985. The Impression: If I were one of Mac’s underlings, she’d be my inspiration. With her professional confidence and instinct, I might not notice what she was wearing. But if I did I would appreciate a leader who dresses like the rest of the team – someone who doesn’t intimidate by wearing clothing I could never afford. From a boss’s perspective, her wardrobe would be considered ‘fine’, but nothing defining. Mac wasn’t hired for her fashion sense. The perception from some higher ups might be that a 2-time Peabody Award winner (the highest honor among journalists) could afford and would wear designer suits. But Mac has more pressing issues than whether her outfit is a custom suit from Donna Karan or was pieced together by a sales associate at The Limited. As Mac’s friend, I would make it my mission in life to expand her accessory drawer. Necklaces, earrings, bracelets, scarves – there are many ways to add some color and spice to her look. Mac got into her position because of talent. She deserves to stick out more than she does.Like many, The Newsroom has kept me captivated on Sunday nights. I look forward to seeing more of Mac and her team at News Night. While Mac’s wardrobe might be nothing special, the show certainly is. Emily Ward-Dickerman is the editor-in-chief of mock-off.com. She has also written stories for Crave Company. You can follow on Twitter for posts about fashion, blogging and celebrity style. *Random Kat story: A few years ago, my then-boyfriend (now husband) and I went to see a small production of a play written by an old friend of his. We were standing in line outside the very small theater and the woman in front of me looked really familiar. “Oh, hey!” I said. “I know you! I think we met at Jeff’s thing the other week.” She tilted her head, confused. “You’re a friend of Cori’s, right?” I said. She was honestly racking her brain, and we started to go over where we might have met. After a few sentences I realized that soft accent, that familiar voice — it was Emily Mortimer, who I should have recognized immediately because Dear Frankie is one of my favorite romances, and I had just seen her on Conan telling a hilarious story about her son. Dear God, I realized, I was Pestering A Celebrity, one of the biggest no-nos among New Yorkers. I choked out “OH! I DON’T KNOW YOU!” and abruptly turned away. I’m sure she thought I was crazy! She was very sweet to play along as long as she did. I love these 360 reviews (it’s too creepy to follow around real professional women and critique their wardrobes). I have only seen one episode of this show and I remember noticing how realistic and accessible her wardrobe seemed. That said, I didn’t like the actual show. Its pretentiousness is stifling… and I like other Aaron Sorkin projects so I don’t mind a little bit of pretension. haven’t seen the show but I agree – I love these 360 reviews! It’s always nice to see professional fashion inspiration! First, I LOVE this show. It’s smart, funny and has the characteristic rapid fire Sorkin dialogues. Both Jeff Daniels and Emily Mortimer are excellent. along with the supporting cast. As for Mackenzie’s style, I do like her blouses. They are clearly expensive, classic (Equipment maybe?) and suit her willowy frame. I agree that it’s a bit spare, and she could use something more to spice up her look, but guess that it’s entirely in keeping with her character that she doesn’t do much more than pull on a skirt and blouse. Compare how well Sloan Sabbith is dressed — she really looks professional, pulled together and quite stunning all the time. I think that contrast is intentional. I hear that the ratings for this show are not good, which makes me sad. There has never been a show to replace West Wing for me. This doesn’t either but it comes closer than anything else. I hope it survives another season. I agree that the contrast between Sloan and Mackenzie is intentional. Remember when Don told Sloan Gucci was sending over some clothes for her? I couldn’t tell if she was frustrated (being an economist) or happy! Yay! I love this show and was nervous when I heard the ratings weren’t what I expected – it’s the best thing since the West Wing! The series premiere, in which President Bartlett clarifies that the First Commandment says, “I am the Lord your G-d, you shall have no other G-d beside me” and then remarks “those were the days” in the face of the crazy Fundamentalist who can’t properly identify the commandments. Don’t stress about next season – it was renewed. Love the show, and love this review. This is basically how I dress (in law, not journalism), except I have learned to use more accessories, which does, indeed, make a huge difference. Kat, I did the same thing to Greg Kinnear once. I actually love, love, love the disc necklace– I managed to track it down online and was disappointed that it’s $1400! I commented on this below, but I suspect very little if anything of MM’s wardrobe comes from the mall. Just because it’s not in your face, doesn’t mean it’s from Ann Taylor. But you can get a version of that necklace for less than $50 from, like, anyone on Etsy. Seriously, there is zero skill involved in making one of those. Love this feature! But it’s a bit hard to see all the outfits or know what is being referenced. For instance, if you’re going to complain about the gold disk necklace, it’d be helpful to see it. I have only seen the first episode myself, but would also add that the clothes didn’t strike me as mall clothes. They were subtle, but much more sophisticated than your typical mall fare. I don’t recall her purse exactly, but it was something shmancy as well. So I dont totally agree with the analysis here, but I do like the character’s style and love the idea of this kind of breakdown. I’d love to see one of these on Selena Meyer and Amy from Veep. Ah! I have to apologize that there wasn’t a clear shot of the disc necklace in my feature. After re-watching the episodes and seeing it with every other outfit, I swear it was haunting me. I must’ve had some part of my sub-conscience saying “nooo!” when I was choosing photos. Thanks so much for your comments. I hope you get a chance to watch the show in full because it is truly spectacular. And now I’m going to check out Veep! I have only seen the first ep, but I do agree that there is a West Wing-shaped hole in my life. The only thing that comes close is Mad Men, but it is missing the witty dialogue which I love. My favourite line ever “in this building, when the President stands, nobody sits”. Same. Loved the West Wing, miss having that kind of show, can’t get into this one. I think my main problem is that I don’t want to watch a show about news coverage of recent current events that didn’t actually happen. I wish that they would just make up the news stories and then insert all the pithy speeches as needed. Does this model change as the show progresses, or is the plan to just go through the past 6 years of news stories? I saw an interview with Sorkin where he said they would be keeping up the same format next season (going back 1-2 years). So events that are current now will probably be featured next season. I love that line. And the look on his face when he says it. swoon. I’m kind of in love with her hairdo. While I I have a similar haircut, mine goes all limp and stringy after about 10 hours. Tips? More hairspray? Hot rollers? Curling iron? Backcombing? Hair transplant? I suspect the answer is that she has thicker hair or curly hair, or probably both. I like it too! I think the answer is a stylist to fix it/re-spray between shots. Probably not possible in real life (too bad). I kind of like that she wears the disc necklace a lot – it feels real to me. I wear the same three necklaces all the time. The world is crying out for an Alicia Florrick 360 review! I dont understand how ppl dress in pencil skirts year round. I mean, we have cold months too. What do you do then? I mean, I love living in pencil skirts but I don’t believe people can actually do that, esp in NYC. In Toronto (where I’m assuming it’s slightly colder than NYC) but I wear pencil skirts in the winter. Either with tights or pantyhose, and if it’s really cold, nice, knee-high boots. I live in Calgary, and while I wear fewer skirts and dresses in the winter, you bet I still wear them! Tights (sometimes 2 pairs – makes a HUGE difference) and boots are the secret. And making sure you are wearing something warm on top, and if you go outside, wear a warm coat that covers your backside, scarf, gloves, etc. It’s definitely doable. Oh, and I have a space heater in my office so I stay nice & warm at my desk all year round. CKB wins! I was in Calgary in January for a week (after not having spent a winter there for 7 years) and with the windchill, it was minus 50 (celcius). I’ve never been so cold in my entire life. I’m in NYC and dress almost exclusively in pencil skirts for work. I honestly don’t remember the last time I wore pants to work. It’s never an issue with the weather because in winter I just wear tights, knee high boots and and a warm knee-length or longer coat. I change to regular heels at work. I have really thick winter wool pencil skirts for really cold days that are as warm or warmer than any pants I could wear. When it’s rainy, sleety or snowy, I get the added bonus of not having the hems of my pants get dirty. I wear skirts and dresses year round (and pants too, nothing against them). In the winter I have these amazing fleece lined tights that keep me warm. If it’s extra chilly, I’ll wear leather boots (also lined). I’ve found that combination is enough to actually make me sweat on mild winter days! I wish I could get over my resistance to wearing tights. After an hour or two, I find them SO UNCOMFORTABLE. Are you wearing tights or pantyhose? I hate the latter, love the former. Also – not all tights are created equal. Some are uncomfortable. I have had good experiences with DKNY tights and Hue brand ones. I live in NYC, and, like some other women here, I wear pencil or A-line skirts all winter with tights. I wear a skirt or dress every day, too. I add tights of increasing density as the weather gets colder. I once stared at a woman in line for coffee for five full minutes thinking, “Do I know her? Did I go to college with her?” until some giggly tweens came up to ask for an autograph from RACHEL BILSON. In my defense, she wasn’t wearing any makeup. Adam Brody was there too, looking like a scruffy, completely ordinary guy. I wouldn’t have recognized him either, without her presence. I think Mac’s outfits are quite realistic and practical for the office…too bad her character is such a shrill harpy. Makes me dislike everything about her :( I seriously heart this show though. Also…I second the Selena review! Her sheath dresses fit her like a glove. My kingdom for her tailor…or stylist. I was once asked to watch the show by a friend who has HBO. I hated it. It was pretentious, didactic, unrealistic. I under stand that Mortimer’s character is treated in a schizo fashion. –She’s a producer, not on-air talent. Accordingly, what she wears is even less important, as long as it’s professional. –The Peabody Award is given only to television journalists. It’s prestigious, but I don’t know if it’s considered the most prestigious. Kat, or anyone: can you identify the black cross halter top evening gown (or maybe it was a black evening top with a long black evening skirt?) at the New Years Eve party in episode 4 (“I’ll try to fix you”)? 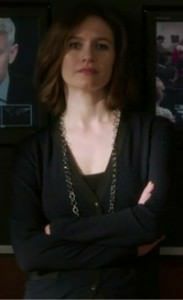 The chief style problem with the character is that no one who looks and sounds like Emily Mortimer would ever have been christened Mackenzie. That’s not a proper name. And I second the Alicia Florrick feature ! Does anyone know where the blouses she wears are from? That’s what I want to know too! I love the tops, but don’t know where to get them. Really though, does anyone know who makes the shirts she wears? I love the ones from the second half of last season. At Vogue.com, Emily’s shirts are described as Equipment. Also, if you can’t afford the Dominique Cohen necklace (or just don’t want to spend that much) she wears a Dogeared karma necklace in the premiere. Check it out on Dogeared.com.